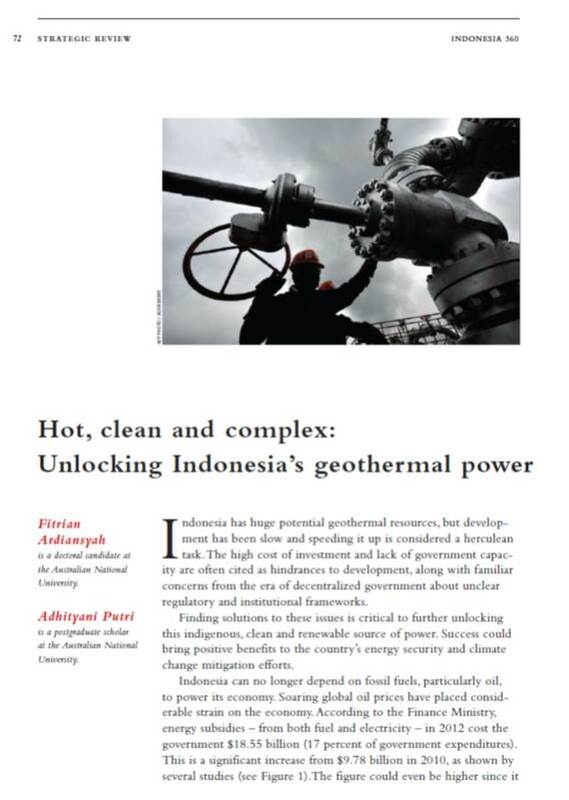 Indonesia has huge potential geothermal resources, but develop­ment has been slow and speeding it up is considered a herculean task. The high cost of investment and lack of government capac­ity are often cited as hindrances to development, along with familiar concerns from the era of decentralized government about unclear regulatory and institutional frameworks. Finding solutions to these issues is critical to further unlocking this indigenous, clean and renewable source of power. Success could bring positive benefits to the country’s energy security and climate change mitigation efforts. Indonesia can no longer depend on fossil fuels, particularly oil, to power its economy. Soaring global oil prices have placed consid­erable strain on the economy. According to the Finance Ministry, energy subsidies – from both fuel and electricity – in 2012 cost the government $18.55 billion (17 percent of government expenditures). This is a significant increase from $9.78 billion in 2010, as shown by several studies.The figure could even be higher since it reportedly underestimates the actual global oil price. With Indonesia’s projected gross domes­tic product growth to remain steady at 4-6 percent and industrial production to slightly increase over the next couple of years, sev­eral studies, including from the National Council on Climate Change (NCCC) and the Energy and Mineral Resources Ministry (MEMR), have estimated that the power sector is projected to grow from 120 tWh (terawatt-hour) in 2005 to 970 tWh by 2030. If Indonesia continues to depend on oil, rising electricity needs would lead to the depletion of Indonesia’s domestic oil reserves sooner than expected. A 2012 statement from the energy ministry estimated that the country’s remaining 10 billion barrels of oil reserves will be exhausted in the next 20 years should no new reserves be found. In fact, the country has been a net importer of both crude oil and refined products since 2004. The formidable task of meeting rising electricity demand requires a funda­mental change in Indonesia’s energy policies, programs and actions. The country could opt for an easier solution, such as utilizing its abundant coal reserves. According to a 2009 World Bank report, the central government already has initiated a “crash program” to bring 10,000 MW (megawatt) of coal-fired power plants online as stipulated in Presi­dential Decree No 71. Many critics, however, argue that while coal-fired power plants can alleviate short-term supply problems and reduce depen­dency on imported oil, the approach fails to address energy security goals and more im­portantly casts a shadow on the government’s pledge to tackle climate change and reduce emissions. Key Indonesian stakeholders in­terviewed in 2011 believed that the new coal power plants – purchased at low cost from China – were mostly dirty and inefficient, according to the paper, “An Environmental Perspective on Energy Development in In­donesia” included in the 2012 book “Energy and Non-Traditional Security in Asia.” If the use of coal continues to dominate the power sector, many experts predict that increased CO2 emissions from electricity generation by 2030 could reach 810 million metric tons of CO2 equivalent (CO2e), an increase of nearly seven times the amount in 2005. Fitrian Ardiansyah is a doctoral candidate at the Australian National University. Adhityani Putri is a postgraduate scholar at the Australian National University. The Strategic Review is the Indonesian Journal of Leadership, Policy and World Affairs with its editorial board led by Dr Hassan Wirajuda (Former Minister of Foreign Affairs) and its advisory board consists of Prof Juwono Sudarsono (Former Minister of Defense), Let Gen (Ret) Agus Widjojo (Executive Board in the Partnership for Governance Reform), Prof. John Thomas (Harvard Kennedy School of Government USA), Prof. Erhard Friedberg (Sciences Po France) and Prof Arne Westad (London School of Economics UK). mas dan mba, bagaimanakah sustainability dari geothermal power di indonesia? apakah infrastrukturnya bisa dipersiapkan dengan segera sehingga dalam jangka waktu yang tidak terlalu lama dapat berjalan konversi dari bbm menuju geothermal tersebut? apakah diperlukan konversi dari kendaraan bahan bakar fossil menuju bahan bakar listrik? akan sustainable kah? Terima kasih atas pertanyaannya. Saat ini tantangan terbesar dari pengembangan panas bumi, seperti yang dibahas di artikel kami yang dipublikasikan oleh Strategic Review ini, adalah aspek pendanaan, penanganan resiko di awal ketika eksplorasi, tumpang tindih status lahan dengan kehutanan, dsb. Silakan lihat juga laporan yang kami buat untuk WWF yang link-nya ada di website saya. Untuk konversi dari kendaraan BBM ke listrik, banyak hal yang perlu dipersiapkan selain aspek infrastruktur. Saya sendiri belum sempat secara mendalam melakukan kajian mengenai hal ini.